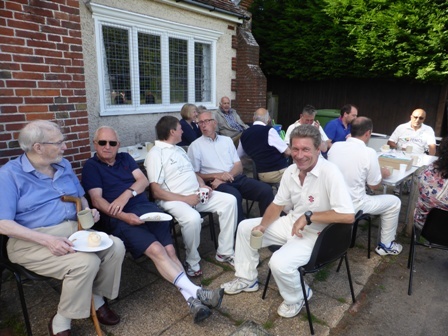 This has been a very enjoyable week for The English Apple Man: It all started with a family barbecue on Saturday with a perfect 'blue sky' afternoon and delicious food. On Tuesday a visit to my dear friends Doug and Estera Amesz in East Kent where their eldest daughter Sofia 'entertained and captivated' us over lunch in the garden. After a 'full English breakfast' the 'head GOB' drew lots for 'who partners who' and with 15 of us drawn into groups of three, with The EAM in the first to tee off with 'head honcho' Gerry Bennington and Andrew McFarlane, both very experienced golfers, and after a 'stuttering' start, my game settled into a mixture of 'mostly' good drives, variable efforts with the 'irons' off the fairway and a mixed 'putting performance' on the greens! 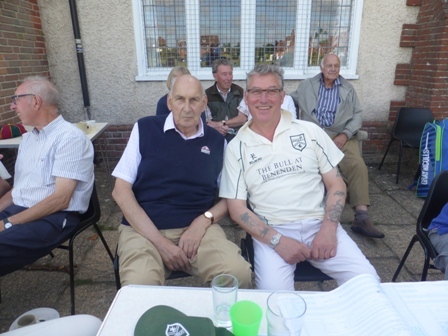 My friends Gerry and Andrew; both true gentlemen, encouraging my performance with 'quiet advice' and some praise. 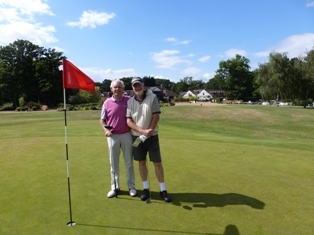 Gerry finished as winner of the Society day with 36 Stableford points 'the second placed golfer scored 32 points - my 11 points poor by comparison, but for a 4 times a year golfer, I was happy to enjoy a day in the sunshine with good friends! 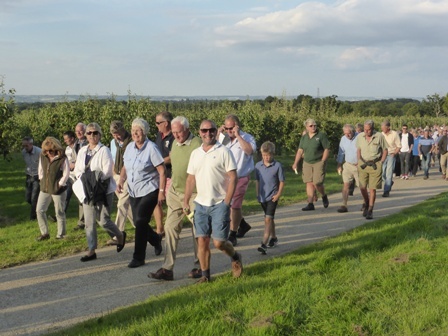 From Hever a drive across to Horsmonden in West Kent for the 66th Goudhurst & Paddock Wood NFU Orchard Competition Farm Walk and Prize-giving held at George Chambers 'Northiam Farm' - Northiam Farm won the prize for the Best Overall Farm in this year's competition and it is traditional to walk the winning farm in conjunction with the presentation of prizes. 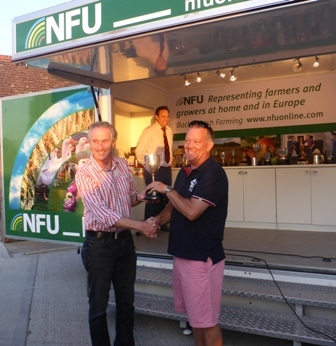 Also present William Steele - Chairman NFU Weald Group who presented many of the prizes. 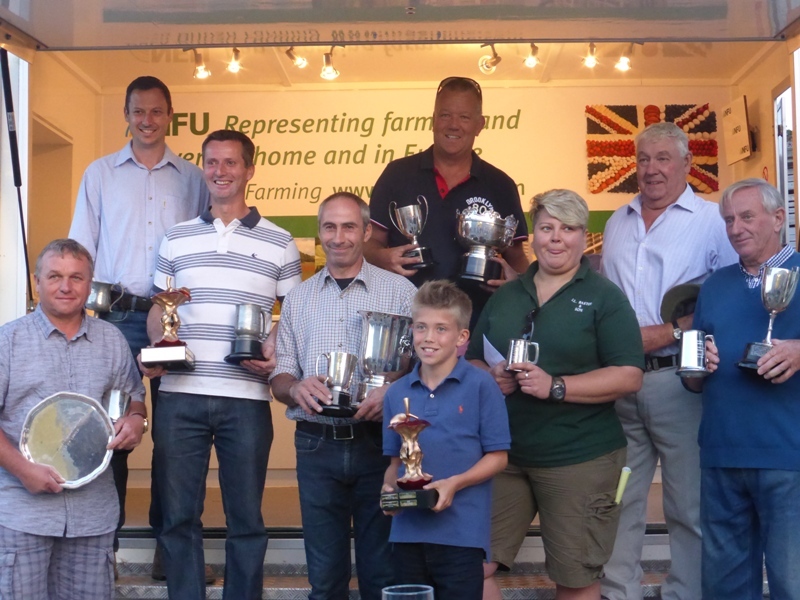 Before handing over to George Chambers, Martin thanked the sponsors; Avalon Produce Ltd. & BASF for their support in making the competition and presentation evening possible. 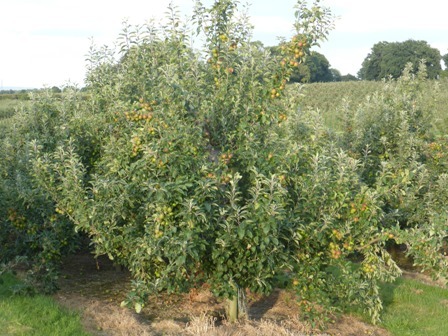 Purchased in 1929 by George's Grandfather, Northiam Farm consisted of 75 acres, which included 29 acres of hops and 30 acres of fruit. 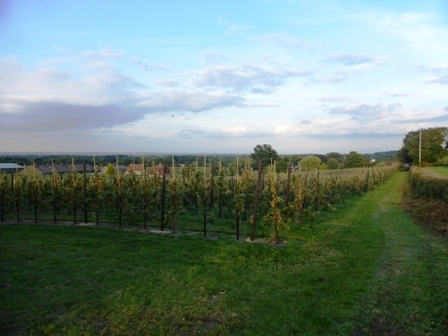 A further 15 acres was added shortly after the main purchase. 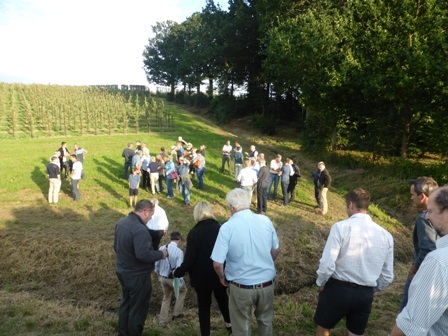 In 1988 another 40 acres was purchased from an adjoining farm. In 1948 the first cold stores were built - 4 x 25 tonne stores. In 2016 Northiam Farm has 15 cold stores amounting to 1,350 tonnes, of which 90 tonnes are CA stores (Controlled Atmosphere). 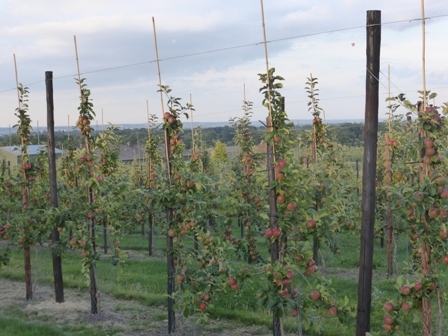 The farm has a pack-house where fruit is packed for Co-op, ASDA Aldi and wholesale markets supplied through Avalon Produce. 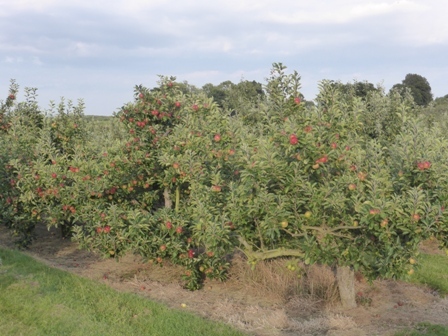 The varieties grown are: Cox, Bramley, Gala, Rubens, Discovery, Worcester Pearmain, and Red Windsor apples + Conference and Comice pears. 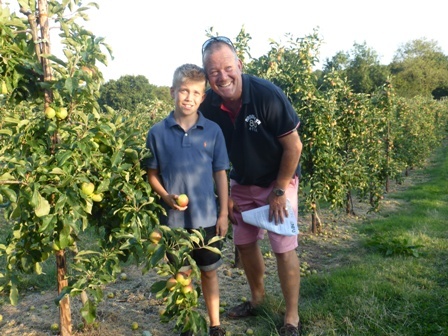 The English Apple Man comments: Every year Northiam Farm seems to carry a crop of good quality apples; with the advent of newer heavy cropping varieties like, Gala and Braeburn it is to be expected that a well managed fruit farm will have a good crop most years, however this is not always the case with varieties like Cox, but George Chambers is continues the tradition that he and his father Mike have achieved with another heavy crop of Cox, albeit some probably carrying too much crop and in need of some thinning. 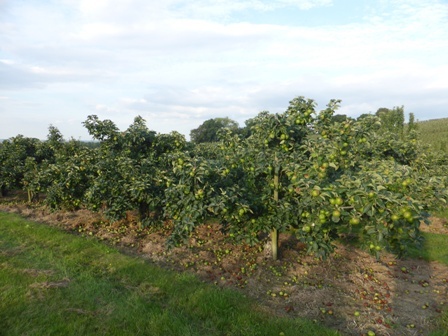 The Bramley is also very heavy and looking under the trees a lot of thinned fruit lies on the ground. 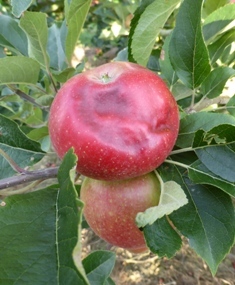 The Discovery trees carry a good crop of good sized apples, which are probably only a week away from the first 'picking over' - the only blot is the level of sun-scorch which after the very hot weather on 19th/20th July has caused significant sun-scorch in many orchards across Kent. Sun-scorch tends to be worst on the western side of the tree, when the sun is at its hottest in the early/mid afternoon. 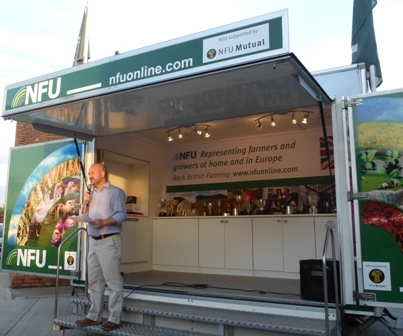 Before the presentations, Chris Hartfield NFU Headquarters Head of Horticultural Sector addressed the attendees on the subject of 'Brexit' and its potential to undermine UK horticulture, unless the UK negotiators are fully conversant with all the critical areas and 'importantly' prepared to fight for a 'level playing field' as any weakness in negotiation could easily result in UK growers losing all the gains made in increased 'home grown' fruit and vegetables over the last two decades. 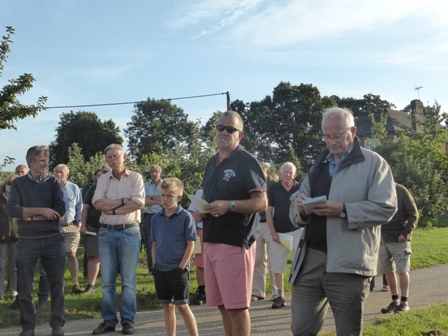 Of course it will not be just UK growers who lose out; UK consumers will be denied home grown produce and with a £4 billion deficit between home grown v imported, it is in all our interests to maintain, and if possible, continue to increase the production of UK fruit and vegetables. 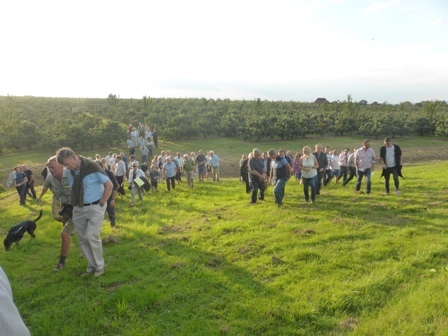 High on the list of priorities is the need for a continued availability of harvest workers from within and outside of the EU. 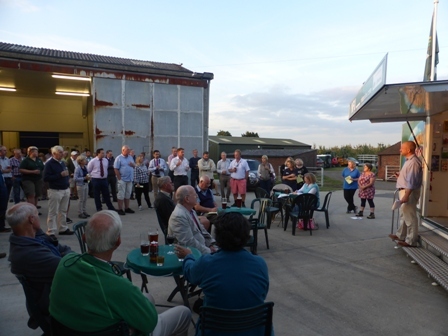 Below: Chis Hartfield addressing the 100+ growers who attended the NFU Orchard Competition Presentation evening. 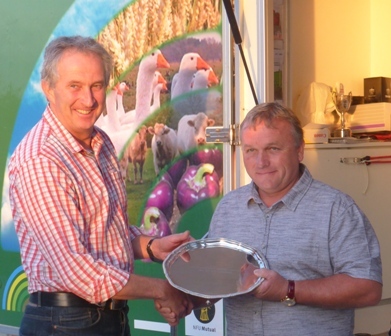 George Chambers - Northiam Farm won five trophies. 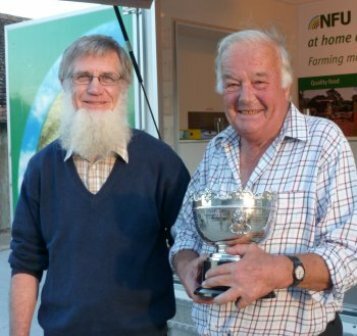 BASF Championship Trophy for 'Overall Winner - BASF Trophy for greatest increase in marks from previous year; N.P.Seymour Trophy for highest marks in Class II; Norman Collett Trophy Class II for highest marks in pest & disease 'control' section; 'joint' winner of Group Secretary Award for highest marks in orchard management - shared with Hadlow Place Farm. 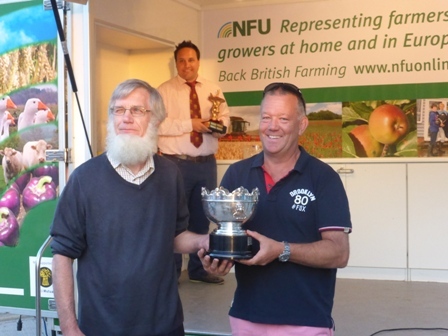 N P Seymour Trophy highest marks Class II - G H Chambers; Norman Collett Trophy Class II highest marks freedom from pest & disease - G H Chambers; Group Secretary Award for highest marks in orchard management - 'joint' G H Chambers & Hadlow Place Farm; Willis Corroon South Ltd. Class II second highest mark Class II - Kent House Nursery Park Farm. 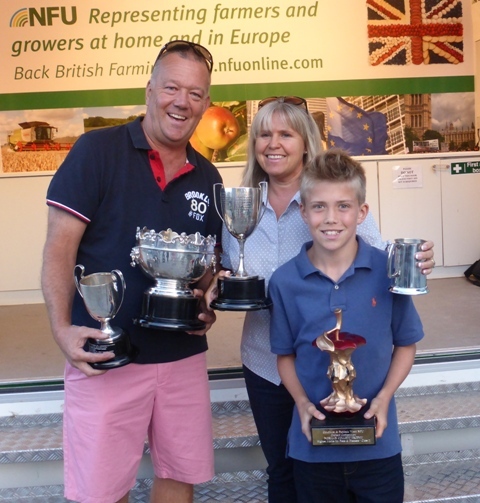 ADAS Trophy highest marks 'young orchard' J L Baxter & Son Amsbury Farm; J A Prall Trophy for highest marks 'Single young orchard' - J L Baxter Amsbury Farm; Lambert & Foster Trophy for Foreman/Employee in charge of young orchards - 'winning farm' in Average Young Orchards Section - Anna Kovalchuck Amsbury Farm; Origin Trophy for highest marks in Management 'Average Young Orchards' - J L Baxter & Son Amsbury Farm. 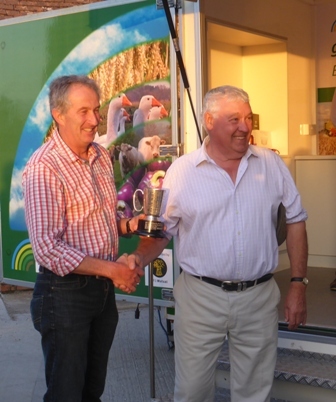 In total; 18 trophies were presented for the various Classes in the competition. 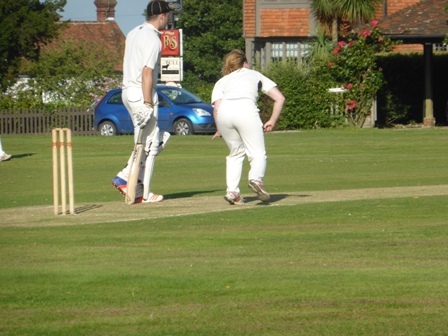 Cricket has been part of village life in Benenden for well over 200 years (recorded history from 1798) and the Green in front of St.George's Church is without doubt one of the most perfect settings for cricket. 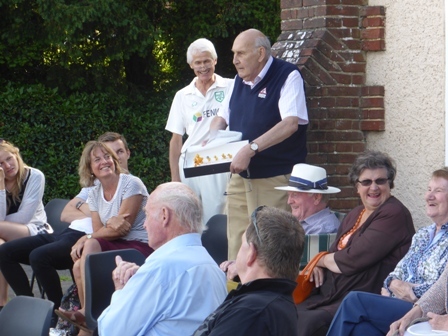 On Sunday (6th July) Benenden Cricket Club members paid tribute to their long serving President - Peter Blockley. 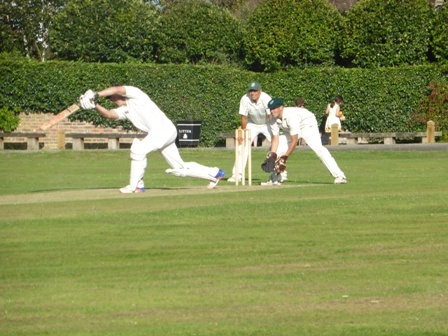 Peter came to Benenden to live in 1981; his house is only separated from the green by the road and a hedge. 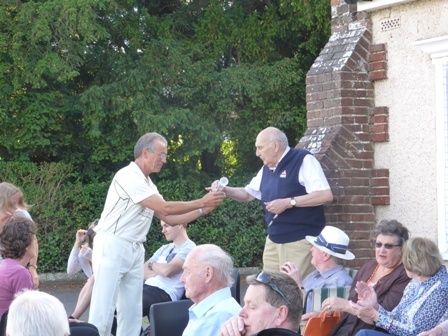 Peter became involved, first as Chairman and then as President. He plans to move to Malta in the near future. 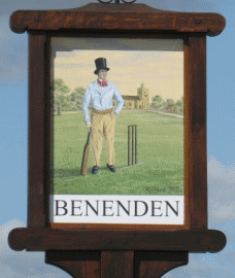 Benenden Village Sign - Commemorates the Local Cricketers Richard Mills and Edward Gower Wenman. 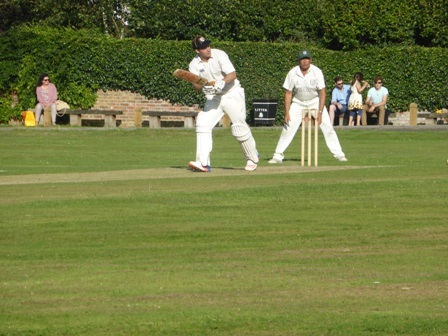 Wenman born Benenden in 1803 was an all rounder but an excellent wicket keeper - Mills born in Benenden 1798 was a left handed bowler, his gravestone in the local churchyard is engraved with a cricket bat. 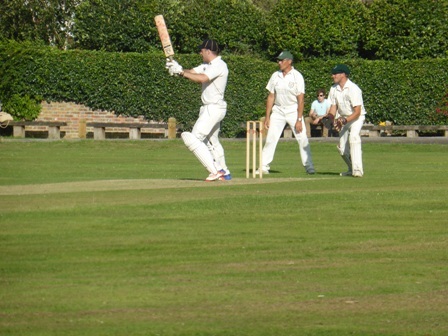 They are noted as having between them beaten an Isle of Oxney team in a match at Wittersham in 1834 winning by 66 runs.